Some of the Ancient Ones believed that good fortune spirits resided in caverns on the Moon. I chose to represent the spiritual travel of Wanderlust. 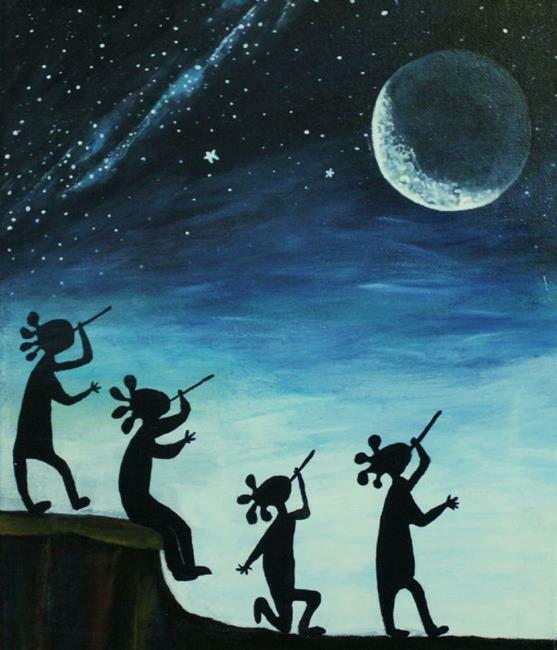 In my painting, the spirits are being called through music and meditation, to facilitate a journey to the spirits who inhabit the moon. In order to create the spatial references between the Earth and the Moon I used varying tones of blue and black. One can feel both the closeness, and yet, the distance relative to the ethereal music of the subjects and their passion to connect with the Moon spirits. Because of the depth of color, one can experience the spiritual travel as well as the physical yearning to travel to the Moon in search of the spirits of good fortune.